Smoked gammon steaks, formed from selected cuts of cured pork leg meat with added water. Keep refrigerated. 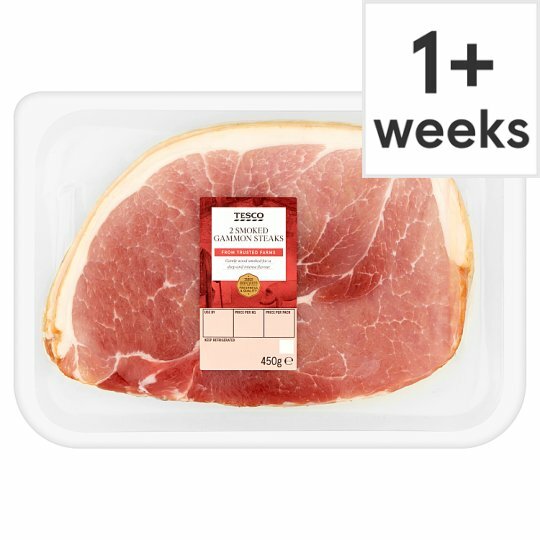 Once opened, consume within 24 hours and always by Use By date shown. Instructions: Place steaks under a pre-heated medium grill for 10-12 minutes, turning once. Remove from grill and rest on a warm plate for 5 minutes. Instructions: For best results, pan fry. Heat a dry frying pan until hot and cook steaks for 1 minute each side, reduce to medium heat and cook for 3-4 minutes each side. Remove from pan and rest on a warm plate for 5 minutes. Hints & Tips:To help with even cooking the gammon steak can be cut with scissors around the fat edge of the steak. This will allow for the steak to flatten out in the cooking process.